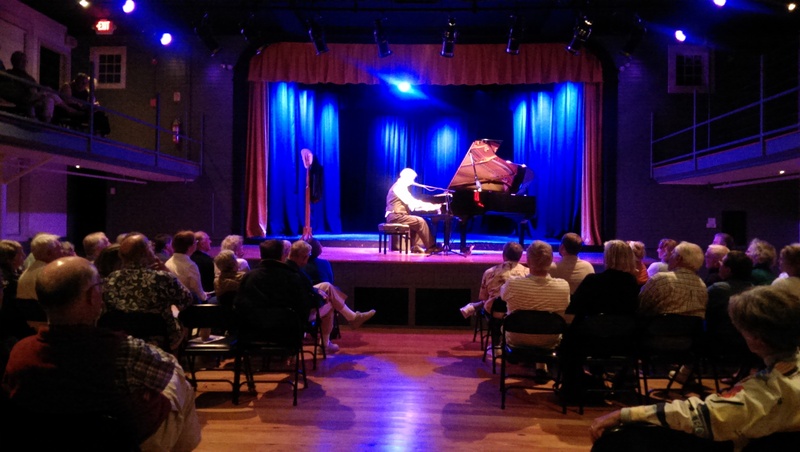 Last week I was visiting a friend in Boothbay Harbor, Maine, where, one night, we enjoyed a concert given by Bob Milne, a ragtime pianist I’d not heard of before that evening. As we settle into our folding chairs at the concert, I had the sense that I would be seeing a local musician. As Milne took to the stage, everything in his demeanor indicated that could be the case. He was an ordinary looking older gentleman, dressed casually and he seemed to be completely at ease in this small setting where about 150 people had come to see him. His opening remarks were amiable and humorous, dryly humorous. Immediately, he captivated the audience with his warmth and down-home style. When his fingers first struck the keys my senses responded with “WOW!” Shame on me for not expecting this white-haired, mild-mannered man to dazzle with his incredible talent. In fact, more than being talented, Bob Milne, I was to learn after the performance, is gifted in a way that is astounding. But I’ll leave that till later. As Milne played his first few tunes, I wondered how such talent was not on my radar. Mind you, I’ve never followed ragtime music, but this pianist, who is from Michigan (not Boothbay Harbor! ), is so astounding, I couldn’t imagine as I watched and listened that his name is not a household word. It may be that Milne had never before crossed my radar but his extraordinary ability at the piano and his knowledge of ragtime, boogie-woogie and the history of music has been noticed by the Library of Congress, which has distinguished him as a National Treasure. Between songs, Milne talked to the audience about his journey at the piano through the years, about the history of ragtime and boogie-woogie, and about piano chords. He talked about cross-genre piano as he discussed how one style influenced another, and he showed that he’s adept at playing classical piano, too. Milne devoted a segment of his evening to Scott Joplin’s music and history. It was a real treat. This story about Milne hints at what has been learned about his mind through a neurological study that’s been conducted on him by Kerstin Betterman, a Penn State neuroscientist. Please take the time to listen to this NPR Radiolab story of the study of Bob Milne’s brain. It will amaze you! In fact, it will blow your mind! Please have a look at Bob Milne’s tour schedule and commit to seeing him if he’s in your area. “Egads!” – I can’t believe this post made its way to you! It was an honor to see you perform in Boothbay Harbor and it’s so pleasing to me to see your comment here on my blog. The post above doesn’t really express adequately how much I enjoyed your show. I was amazed at how much music history and information you packed in and around your incredible piano playing. I’ve been singing your praises since seeing you in Maine! I hope to see you perform again. I’m so glad you saw this post since your daughter has interest in ragtime piano! And I hope you are able to see Bob Milne in Indiana. He’s a wonderful person and very approachable if it’s a small audience. He joins the crowd during intermission and after his concert. He talked about a week-long lesson that he offers for a “ridiculously low” cost. I think he said people of all ages and all musical abilities attend. Maybe you can find something about it on his website and consider it for your daughter. By his description, it sounds fantastic.